This morning, the North Carolina Smokies awoke to a thick blanket of snow. While the peaks of the Smokies have already had several snowfalls, this is the first of the year in the lower elevations. 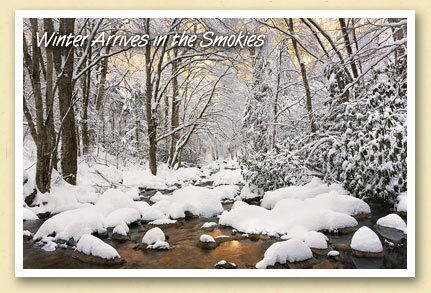 And what better time to adorn a postcard with Scott Hotaling’s “Winter Gold”. Scott is an area photographer who routinely captures the Park’s beauty. For more of Scott’s photography and print information, visit his website at LightOfTheWild.com.